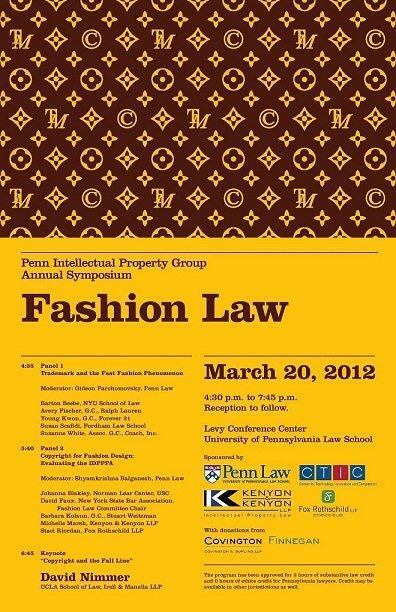 There has been quite a flap surrounding the poster and invitation used by the University of Pennsylvania Law School to promote Penn Intellectual Property Group’s Fashion Law Symposium, scheduled for a week from tomorrow. The symposium . . . boast[s] an all-star cast of general counsel from the fashion industry, including those from Ralph Lauren, Forever 21, and Coach – to discuss in the first panel: ”Trademark and the Fast Fashion Phenomenon.” The second panel is set to discuss “Copyright for Fashion Design: Evaluating the IDPPPA.” Last, copyright scholar David Nimmer is addressing “Copyright and the Fall Line” in his keynote address, and a number of big name law firms are symposium sponsors or donors . . .
Louis Vuitton — owner of the likely famous trade dress and individual marks depicted on the designer bag shown above — objected to the use of the poster shown below in this cease and desist letter, and LV now has been branded a serial “trademark bully” for it (and past objections against other alleged infringements). The Penn Law School Associate Dean for Communications apparently agreed to cease use, but then the accommodation was formally withdrawn by the University’s Associate General Counsel, in this response letter, defending the poster as a clever parody. As far as I can tell, the coverage of this flap is highly critical of Louis Vuitton for sending the demand letter in the first place, and entirely in favor of the University’s final decision to not cease use; for some examples of the coverage, see Techdirt, Above the Law, Law of Fashion, Eric Goldman’s Technology & Marketing Law Blog, The Volokh Conspiracy,Johanna Blakely, and Alison Frankel’s ON THE CASE. While I tend to agree the tone of the LV letter was excessive, and a few carefully-placed phone calls instead of a written demand, with greatly toned down the rhetoric, likely would have been more effective, what has left me a bit surprised by the coverage of this dispute is the absence of any scrutiny of the University’s response or position. [I]t seems no one is asking any questions probing the University’s claimed parody, and my concern about the popular ”trademark bully” label and a social media shame-wagon approach to this issue is it sends the wrong message in that it greatly oversimplifies a very complex body of trademark parody case law — decisions that most counsel as quite unpredictable if they ever go the distance. Like it or not, unlike the defense of federal dilution claims where certain conduct is excepted from liability, neither noncommercial use nor parody is excepted from or an affirmative defense to trademark infringement. Parody is really just another way of saying, there is no likelihood of confusion, which no one will know for sure, without credible survey evidence of the relevant public. . . .
Is it not at least plausible that the modified LV artwork was designed to simply attract attention and fill seats in the auditorium, and not to make fun of LV, and that LV’s design was so meticulously reproduced that some who see it won’t even notice the subtle changes? After all, trademark parody case law certainly supports the proposition that the more outlandish, outrageous, shocking and/or offensive the parody, the less likely confusion will result. We’ll probably never know, but it wouldn’t surprise me at all – if survey evidence were pursued on these facts – to find support for an actionable level of likelihood of confusion as to LV’s sponsorship, affiliation, connection, or approval of the fashion law symposium, especially since LV noted it has sponsored such events by other schools (Fordham Law School’s Fashion Law Institute). This, it seems to me, is a key alleged fact overlooked in the Associate Dean’s response. Moreover, the focus on comparing luxury goods to educational seminars seems to miss the mark, as there appears to be a direct overlap in the sponsorship of fashion law seminars. I think Steve is right on every point here. Because of trademark dilution, it was appropriate for LVMH to do something. What they did do, how they did it, was over the top, unnecessarily harsh and bellicose, and typical of the genre I moan about here non-stop these days. It was also not very smart lawyering, because the usual risk of a Streisand-effect reaction was high here — this was not just any cease-and-desist recipient. So the criticism is not unjustified. Was LVMH wrong for bawlin’ over ballin’? LVMH can hardly be blamed, given the weapons at its disposal, for dedicating a bunch of them to this brand-management-by-litigation-signals game. Doing so imposes costs on defendants and would-be defendants who will seldom have embossed purses of sufficient size to defend. Is it wrong to fight till the buzzer against the death of your billion-dollar brand? 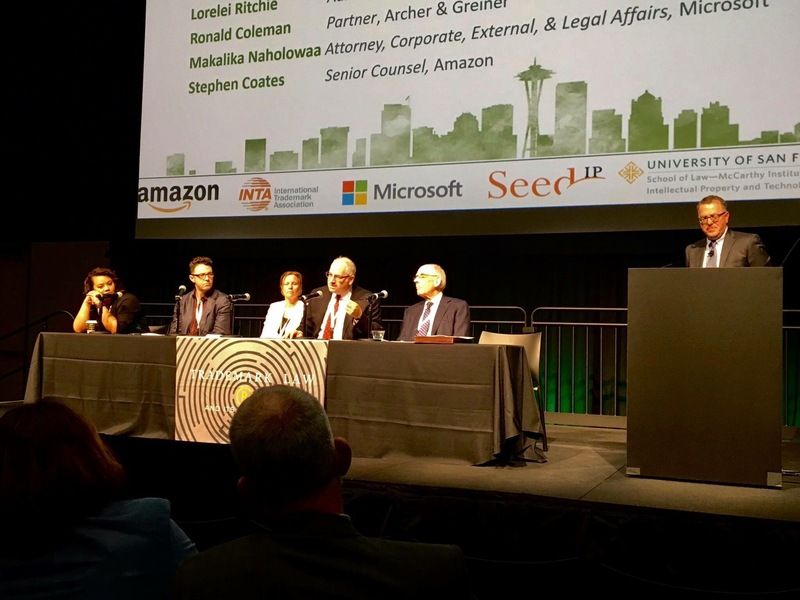 IP litigation is not an appropriate vehicle to stake out, much less appropriate, what should be the free semiotic and even commercial territory surrounding legitimate trademark rights. But thanks to the Chewy Vuitton decision, the legal trend respecting LVMH’s unique brand threatens to get disturbingly deep “into the paint” and threaten the bona fide trademark protection due that phenomenally valuable brand. What else can LVMH do but play tenacious defense? So . . . while it’s no layup I can’t say the LVMH dilution drive here is meritless. LVMH may or may not win its dilution case against Hyundai, but its dilution claims are not frivolous. And I can’t say the strategy in bringing them is any less legitimate than the full-court press you’d expect from a team with a lot at stake in keeping the ball as far away from their high-rent hoop. True then, true now. (UPDATE: The court agrees!) LVMH has to do what it has to do — but not necessarily the way they did it here. How you say it matters — isn’t that at least half the game when it comes to “bullying,” after all? UPDATE: Further thoughts from Charles Colman. This is a good and fair analysis. I was unaware (despite being a Fordham Grad–doh! (R)) that LV sponsored fashion law symposiums. That seems like an important detail. And I’m generally dubious of the parody defense as it has become a catch-all excuse for people who just don’t feel like getting permission (it’s also a common excuse for slander/libel). Still, especially given the fact that LV does sponsor similar events, it’s hard to see why they didn’t just send UPenn an “ahem…excuse me” note and offer to keep quiet in exchange for sponsor billing or some such.